In 2013, Mono County employees embarked on the County’s first strategic planning effort. The county took a unique approach in inviting all employees to participate in the process from the ground up. 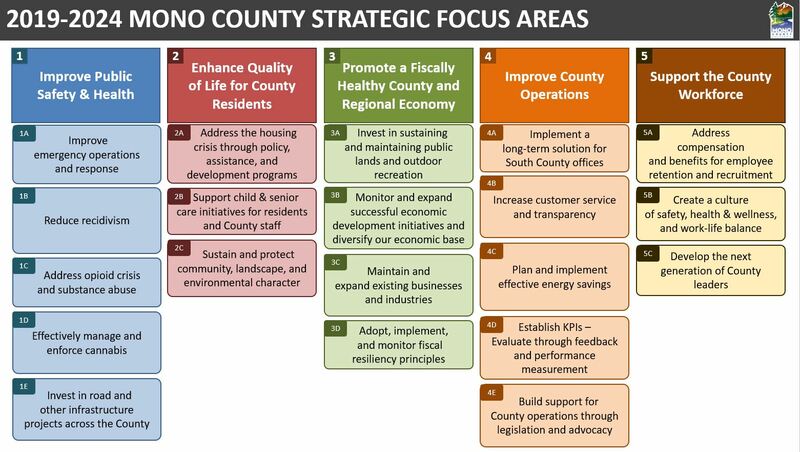 Two years later, the Board of Supervisors endorsed the Mono County Strategic Plan Framework that included Mono County’s Mission, Vision and Values. Strategic Planning is a process that focuses an organization on long-term issues, establishes clear purpose for all staff and produces a system of results oriented measurement that reinforces how best to use scarce resources for maximum return. As resources have diminished over the last 15 years and more dramatically in the last six, Strategic Planning has given the public and policy makers the ability to focus not merely on the next year but the next five, ten and twenty years, and build an effective understanding of services and the necessary focused investment for service improvement. Effective Strategic Planning goes beyond identifying and completing tasks but changes how we do business at the County and provides new methods to engage our employees in building a Higher Performing Organization. It builds context for all operations.